My first solargraphy image, below, is the result of a 128 day exposure made from August 16 through December 21, 2014. 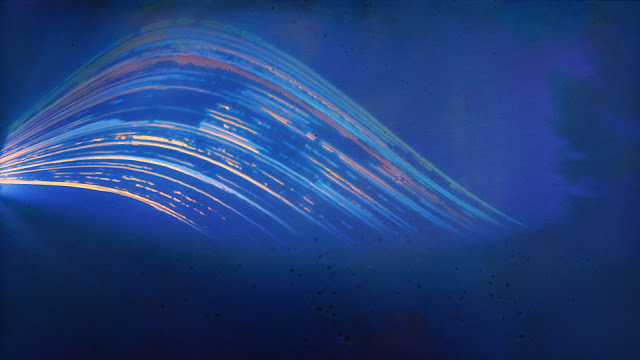 Solargraphy is an alternative photography process that uses homemade pinhole cameras and very long exposures to record the suns movement across the sky over days, weeks and months. A single image allows for a view of space, time and weather patterns that we are normally not able to see. Uniquely, it reveals the gradual change of the sun’s path from one day to another, due to the Earth’s slightly elliptical orbit and 23.5° tilt. The missing or broken trails are the result of periods when clouds have obscured the sun. As a photographer committed to the using the best tools and techniques in order to produce the most technically competent photographs I can, solargraphy is a wonderful lo-fi liberation from technology. Much of its beauty is the result of uncontrollable factors such as moisture, dirt or fungus that may invade the camera, temperature fluctuations and whether the days are sunny or cloudy. The camera was facing west-northwest over Georgian Bay. The tree line is visible on the right side of the frame and there is a hint of the shoreline along the bottom. Every day the sun burned a new trail, the highest in this image from mid-August, the lowest on the winter solstice. What I like most about solargraphy is that in contrast to the instant gratification digital age we live in, solargraphs take their own time, and the results are often a surprise. More to come, in good time.